We pinpoint the exact moment the tide started to turn against Meghan. The Duchess of Sussex has quickly risen to become one of the world's most-watched women. In fact this year, Meghan Markle topped Google's most searched global figures of the year for a second year in a row. We love to fawn over Duchess Meghan's outfits, watch her cradle her adorable baby bump and can't get enough of her incredible love story with Prince Harry. While the expectant mother has enjoyed several years of overwhelming public support, suddenly the tide has turned against her. The 37-year-old former Suits actress can no longer escape the almost daily rumours being leaked from Kensington Palace about the supposed rift her arrival has caused. Whether it's right or wrong, the rumour mill is swirling. So how on earth did this happen? How did the most adored woman in the world become the subject of such vicious tabloid chatter? Here's a timeline explaining exactly how it happened. Just 18 months after they were first introduced by friends in London, Harry and Meghan announced their engagement to the world. Arriving to their photocall with the world's press hand-in-hand, the new couple couldn't take their eyes off each other. But this happy news didn't come out of the blue. The announcement came just months after Kensington Palace released an extraordinary statement begging the media to give Meghan some privacy. This was a clear indication that Harry was serious about this relationship and didn't want to scare Meghan off. News coverage at the time was overwhelmingly positive. Finally the heartbroken little boy that walked behind his mother's coffin in 1997 had found his happily ever after. Everything about this wedding was straight out of a fairytale - the nervous Prince, the beautiful bride in her custom Givenchy gown and that stunning veil embroidered with all the flowers of the Commonwealth countries. As Harry and Meghan shared their first kiss in front of the world, we collectively swooned. Once again, Harry and Meghan mania dominated the headlines and unsurprisingly, the number one news event of 2018 was the Duke and Duchess of Sussex's royal wedding. An estimated 1.9 billion tuned in around the world to watch the couple exchange vows at St George's Chapel, Windsor in May with their wedding injecting an estimated $AUD3.5 billion dollars into the British economy. Whether it was fans stocking up on their Meghan and Harry memorabilia or tourists jetting into Windsor from around the world, the pin-up royal couple were literally worth their weight in gold. Ok, so we know Harry's obsessed with Meghan, but what about The Queen? Back in June, the newlywed and Queen Elizabeth had their first official royal outing together and it could not have been more of a success, with the pair looking close and spending the whole day giggling together. At one point during the day, the Queen stepped in to lend a helping hand to the nervous Duchess. In a moment of confusion when entering a car, Meghan was unsure if she or the monarch should get in first. A flustered Meghan stepped back to let the Queen enter the car first. Soon after this cute day out, it emerged that Meghan has her own nickname for the Queen. According to the editor of Majesty magazine, Meghan refers to the Queen as "Mama, rather than the traditional "Ma'am". In their official engagement video released by the BBC, Prince Harry even jokes that the Queen's dogs took an instant liking to Meghan. "I've spent the last 33 years being barked at, this one walks in, absolutely nothing," Harry said of Meghan's first encounter with the royal pups. "Just wagging tails, and I was like, 'Argh.'" The only thing better than one Duchess, is two Duchesses! Kate and Meghan decided to ditch their husbands for their first solo outing together at Wimbledon, to watch Meghan's good friend Serena Williams in the grand final. Duchess Kate is a huge tennis fan, a Wimbledon Patron and a regular in the royal box. She and Meghan both looked stunning in their chic outfits and chatted amicably throughout the match. While some commentators believed their outing was a genuine display of friendship, others speculated the pair were simply tolerating each other for the sake of the cameras. OCTOBER 2018: A royal baby! Just hours after the Sussexes touched down in Sydney for the first stop of their royal tour down under, Harry and Meghan confirmed they are having a baby! The next day, Meghan debuted her mini baby bump to the world in a chic white dress from Aussie designer Karen Gee. Now we're used to seeing Meghan cradle her stomach, but the first time we saw that was when the couple visited Fraser Island. Meghan wore a beautiful blue and white striped linen dress from US brand Reformation and held her bump as she walked hand-in-hand with Harry. Throughout the two week-tour, Meghan amazed locals and indeed, the world. She got up at 4am to do yoga, baked banana bread late at night and didn't drop the ball once during an insane travel schedule. We were all in awe of her poise, grace and patience. READ MORE: The moment Meghan's baby bump really popped! Royal fans could not get enough of Harry and Meghan, with huge crowds turning out all around the country to get a glimpse of the happy couple and that cute bump. "From myself, my wife and our little bump, we are so grateful to be here," Harry said at the time. Meghan was praised for delivering a powerful speech about feminism and women's empowerment in New Zealand. One fan wrote on Twitter: "You're championing woman! You're using your platform to shine a light on woman's rights! Thank you so much for staying true to yourself!" While another said: "WOW. great speech and my goodness is she gorgeous and well spoken!" This is the exact moment when things started to shift. Last month, the Duke and Duchess announced they would be moving out of Kensington Palace, where they currently live next door to the Cambridges and their three children, to Frogmore Cottage in Windsor. The sprawling 10-bedroom residence, which was gifted to the couple from The Queen, sits within the private Home Park and looks out onto the stunning grounds of Frogmore House. Meghan reportedly wants to renovate the property to include a new nursery and a gym and yoga studio. "Windsor is a very special place for Their Royal Highnessess and they are grateful that their official residence will be on the estate," Kensington Palace said in a statement. Harry and Meghan were married in Windsor's St George's Chapel and their reception celebrations were held at Frogmore House. But royal sources have been leaking gossip to the British tabloids, claiming the Sussexes are moving because of tension with Prince William and Duchess Kate. "The initial plan was for Harry and Meghan to move out of their cottage in the grounds of Kensington Palace and into one of the main apartments. But there has been a bit of tension between the brothers," a source told The Sun. Meanwhile, a new bombshell new report from The Sun has also shed light on Meghan and Harry's supposed tempers before their wedding. In an astonishing allegation, the Queen was forced to step in and pull Meghan and Harry in line after Meghan was told she couldn't wear the original tiara she'd picked out from the Queen's collection. "Meghan had her heart set on this tiara with emeralds and Prince Harry hit the roof when they were told it was impossible for her to wear it," a spy told The Sun. As the origins of the tiara couldn't be 100 per cent confirmed and with fears it could have questionable ties to Russia, the Queen apparently would not loan it out. "There was a very heated exchange that prompted the Queen to speak to Harry. She said, 'Meghan cannot have whatever she wants. She gets what tiara she's given by me,'" the insider claimed. Adding: "The Queen also questioned why Meghan needed a veil for the wedding, given it was to be her second marriage. The message from the Queen was very much Meghan needed to think about how she speaks to staff members and be careful to follow family protocols." You know you've misstepped when you get a stern dressing down from the Queen. Many royal insiders have insisted there's actually no bad blood between Duchess Catherine and Duchess Meghan, but their respective husbands are not getting along. A source told Vanity Fair that there is no feud between Kate and Meghan. "Kate and Meghan are very different people and they don't have a lot in common but they have made an effort to get along," said the source. "Any issues are between the brothers." Some sources have said Harry and William's bond said to be "almost irretrievably broken" because William "refused to roll out the red carpet" for Harry's new bride. "Harry didn't think William was rolling out the red carpet for Meghan, and told him so," a source spills of the brother's rift. "They had a bit of a fallout, which was only resolved when Prince Charles stepped in and asked William to make an effort." Three royal aides have resigned since Meghan and Harry got married in May.This week, it was announced that Samantha Cohen, private secretary to Harry and Meghan, will leave their service in British spring 2019 - after the birth of the new royal baby. She's worked with the royal family for 17 years. According to The Times, a source close to Meghan said: "Sam will be a huge loss." "Going forward, Meghan might need someone cut from a slightly different cloth to traditional courtiers, who is not a career civil servant or royal insider". Nicknamed Samantha 'The Panther,' the former royal aideserved as assistant private secretary and communications secretary to the Queen and was one of her most trusted members of staff. Last month, a palace aide and assistant called "Melissa" quit because of what the Daily Mail described as "Hurricane Meghan." She reportedly put off staff with her "particular brand of 'up and at 'em' West Coast energy" and rumoured routine of "getting up at 5am [and] bombarding aides with texts and her eyebrow-raising fashion. "Meghan put a lot of demands on her and it ended up with her in tears," a source The Mirror. The Palace has refused to comment on all of these rumours, except for one fact. 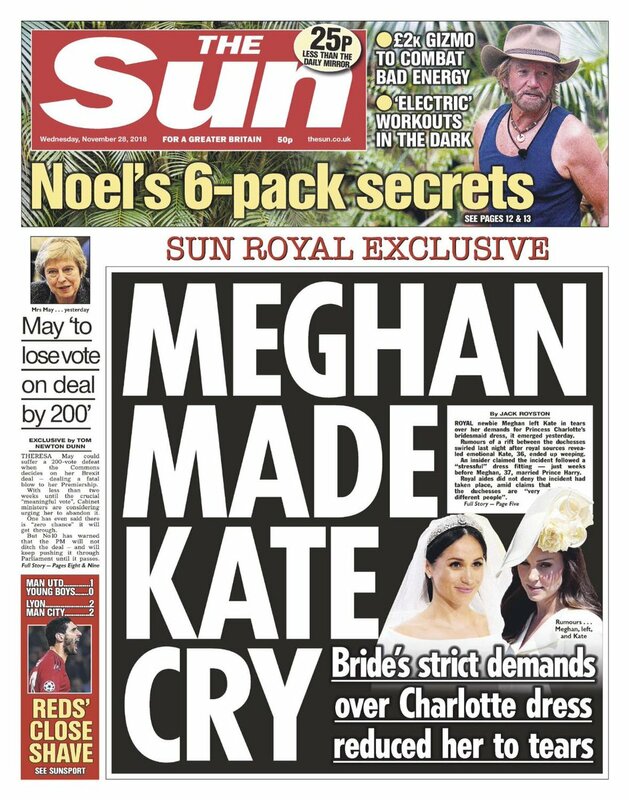 Britain's top selling newspaper The Sun claimed tension between the royal sisters-in-law reached boiling point when Kate cautioned Meghan over her strict behaviour towards her staff members, telling her: "That's unacceptable, they're my staff and I speak to them." A source revealed to the publication: "Her and Kate fell out when she b - - - d Kate's staff." The Palace was quick to shut down the report, releasing a rare statement saying: "This never happened." Last week, a royal insider told US Weekly that Meghan is "fed-up" with the rumours and her inability to "stand up for herself" on social media. Meghan reportedly feels like she "has no voice" and is "frustrated" that she is unable to defend herself. "It's just been frustrating and stressful to have no voice," a royal source told the magazine. 'She's always relied on her own voice to stand up for others, and for herself. So not being able to say anything is a debilitating feeling. When all else fails, you go to the Queen to sort the drama out. That's exactly what Duchess Catherine did on Thursday, driving herself to Buckingham palace in a Range Rover to have a secret meeting with the Queen. Was she there to discuss these ongoing feud rumours? We'll have to wait to find out. Around this time of year, the royals release their new Christmas card photos. They're always super cute and candid - and this year was no exception. But it's interesting to note that the Cambridges and the Sussexes chose to release two separate photos of their own families on the same day, through Kensington Palace's official social media accounts. Duchess Catherine and Prince William released an adorable picture of their family-of-five dressed in jeans on a tree trunk outside their country home in Norfolk. The three youngsters, Prince George, 5, Princess Charlotte, 3 and Prince Louis, 7 months are seen cuddling up to their parents and looking utterly charming. Meanwhile, Prince Harry and Duchess Meghan's Christmas photo is a never-before-seen picture of the pair at their wedding in May. The couple are hand-in-hand, facing away from the camera, sharing a romantic moment on the grounds of Frogmore House, the Windsor residence they are about to call their new home. Many royal fans took the photo as a sign of a subtle snub. With the couple faced away from the camera, many interpreted that message to mean they are turning their back on the naysayers. One fan on the Kensington Palace Instagram account described the pose as "icy". "Icy is the word, of course it carries not so subtle messages," they wrote. "Looking at their backs?? For Xmas wishes??? Rude!!!!" But others disagreed. Another fan commented: "It's a beautiful photo. I love them! It's their first Christmas as a married couple and this was a special moment for them this year. Why not sure it. Who cares if you can't see their faces. Big deal! We see their faces everywhere. I love it!" Whether or not the Sussex's Christmas photo was an intentional snub, there's no denying the press has changed their tune and royal fans are following suit. 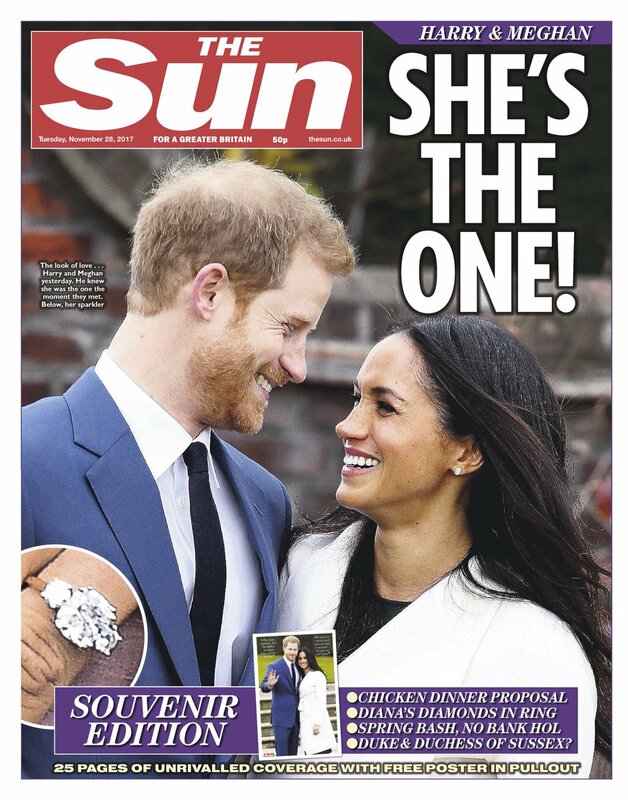 Just look at this side-by-side image showing the difference in media coverage between Harry and Meghan's engagement, and now. Slide across to see what a difference a year makes! The royal family traditionally spend Christmas Day at their Sandringham country estate in Norfolk and attend an annual church service together. Despite rumours of a feud between our favourite "Fab Four", the two young couples showed a united front as they happily walked together into the church, smiling at onlookers and receiving flowers. All eyes were on the Duchesses, analysing every movement to see if they really were playing happy families. The pair appeared chatty and amicable, smiling to each other. The Internet even went wild when Meghan rested her hand on Kate's back - a gentle attempt at conciliation, perhaps? It's interesting to note that while Meghan and Harry walked arm-in-arm - which is just standard PDA for them - Kate and William simply walked side by wide. But take another look at William and Harry. They may have walked together like they did last year, but the two royal brothers kept their distance with their wives in the middle and did not interact at all. In fact, body language expert Judi James says it's a very different scenario to their normal relationship. "We've been so entranced by the two women that we've forgotten about Prince William and Prince Harry. Apart from having very rigid, fixed smiles on their faces, I didn't see anything in the way of glances or exchanges between them," she told The Daily Mail. "They've always been seen laughing and sharing jokes, they usually have lots of 'tie-signs' (gestures that signal closeness) between them. They've both got their hands stuck in their pockets and I didn't see any connection signals between them at all." EARLY JANUARY 2019: Meghan snubbed from Kate's birthday celebrations? The Duchess celebrated her 37th birthday on January 9 with a very low-key celebration at home with family and some close friends - but not everyone was invited. Meghan reportedly suffered an incredibly deliberate snub by her new sister-in-law from the event. "Kate had a gathering for her 37th birthday at Kensington Palace," a source told Woman's Day. "It was her, William, the kids, her mum, dad, sister Pippa and husband [James Matthews]. Harry and Meghan were not invited, which she deemed humiliating." READ MORE: Meghan Markle exposed - "It's all been one big act!" Meghan can't seem to escape the theory that she is difficult and demanding, particularly to her staff. That rumour doesn't seem to be dying down any time soon, with yet another royal employee resigning. This time it's her female bodyguard. The bodyguard reportedly resigned from Scotland Yard due to the challenging nature of the role, particularly as Meghan wished to be seen as "one of the people".